Children, teens, and adults alike experience stress. Stress can be a positive force giving ourselves and our teens extra energy when needed. But, our response to stress can also have negative effects causing family arguments, preventing teens from taking important and necessary risks, and even, creating physical symptoms like headaches and stomach aches. As a parent, you play an essential role in your teen’s success. Helping your teen learn to manage stress is an important skill they will use throughout their life. Teens and emerging young adults ages 15-19 are in the process of learning to manage their strong feelings, understanding the increased expectations of them at home, growing friendships and beginning romantic experiments or partnerships, and attempting to meet academic performance standards. All these new experiences can cause stress. This stress is normal but can have a direct impact on their ability to choose healthy habits like eating well, sleeping enough, and getting exercise. Teens experience stress: 36% report feeling tired, 31% report feeling overwhelmed, and 30% feel sad or depressed. Despite these symptoms of stress, teens are far less likely than adults to make the connection between physical and mental health and stress.1 How teens learn to deal with stress can advance or harm their development. Your support and guidance as parents matters greatly. In addition to the normal stresses that teens face, there is another level of intense stress that can impede a teen’s brain development that is particularly concerning called adverse childhood experiences. These experiences might come from family members who are dealing with substance use disorders, mental illness, or domestic violence. Exceptional childhood stress can be experienced by any child who experiences physical or emotional neglect or abuse. You may consider whether or not you yourself endured an adverse experience as a child. The majority of parents have. Your own experience can cause greater anxiety in your parenting as emotional memories are triggered through everyday normal developmental challenges your teens present to you. As we attempt to parent in new ways from our own upbringing, these challenges arise and require our attention. If we learn our own set of coping strategies, and if we plan and practice new strategies, we can manage even our toughest moments with self-compassion while teaching our teens vital skills. The following steps will prepare you to help your teen through the kinds of stressors we all commonly face. The steps include specific, practical strategies along with effective conversation starters to guide you to help your teen manage stress in ways that build up their resilience and skills for self-management. Whether it’s your fifteen-year-old slamming their door shut at homework time when they cannot figure out a problem or your seventeen-year-old staying up late worrying about why their best friend isn’t talking to them, stress and how to deal with it can become our daily challenge if we don’t create plans and strategies for dealing with it along with input from our teens. This five-step process helps you and your teen manage stress. It also builds important skills in them. The same process can be used to address other parenting issues as well (learn more about the process). Practice actively listening to your teen’s thoughts, feelings, and worries. It’s easy to skip to problem solving when it comes to our teens. Because we have a tendency to project our own worries on our teens when they may be concerned with something different altogether, use your best listening skills! The best way to find out whether or not your teen is stressed is by offering a safe space for them to talk without fearing judgment. Explore the mind-body connection. In calmer moments with your teen, ask, “How does your body feel when you are stressed? How does your body feel now? What’s the first tell-tale sign that you are getting stressed?” See how descriptively they can list their physical signs of wellbeing. For every person, their physical experience will be different. Find out how your teen feels and make the connection between those symptoms and the normal feelings they are having. Fifteen-year-olds are in the final year of major physical changes that occur in puberty. They may feel a bit insecure and sensitive to criticism. Their peer group can present all sorts of worries including who’s in the “in” and “out” crowd. Sixteen-year-olds have new important goals and worries outside of school related to learning to drive, getting a driver’s license, getting a part-time job, or trying out a romantic partnership. Seventeen-year-olds have more serious pursuits on their mind as they consider the fact that their graduation is coming up, and they’ll need to face life after high school. Invincibility, overly confident, fragile, and scared are all common expressions. Eighteen and nineteen-year-olds are now considered emerging adults and may be entering college or facing living on their own for the first time. For this reason, they may be eager to discuss the complexities of adult responsibilities. Model for yourself (and your teens will notice and learn). Practice deep breathing daily. Use the smell of your morning coffee or tea to remind you to start your day taking some deep breaths from your core. Try and make a routine of taking 5-10 deep breaths to help your begin the morning calm and focused. If you run into stressful situations during the day, remember to breathe deeply in the midst of the chaos to help you better cope with it. Create quiet time. Busy schedules with teens are inevitable. However, we all need quiet, unscheduled time to refuel. Say “no” to social commitments when it’s just too much. In addition to guarding your teen’s quiet time, be certain to carve out your own. Notice, name, and accept your feelings. We, as leaders of our household, can get in the habit of reassuring family members, “We’re fine,” even when we are not so fine. Yet, we need to be models of emotional intelligence if our teens are to learn to manage their feelings. So, notice what you are honestly feeling and name it. “I’m tired and cranky this afternoon.” Accepting those feelings instead of fighting them can be a relief. And then if you want to change what you are feeling, you can take action toward change. “Stay on your own mat.” This is an expression from Yoga. It means taking responsibility for your own thoughts and feelings and behaviors and not trying to control your teen’s feelings. Ask “What is my teen developmentally ready to try?” Allow for healthy risks, realize it will not be done perfectly or at times, in the ways you expect, but you can trust your teen’s ability to solve their own problems with your loving support. Learn together! You’ve learned what your teen’s physical signs of stress tend to be, and hopefully, you’ve reflected on your own as well. Now, understanding how your brain – for both adults and teens – operates when feeling anxiety is critical in shaping your responses and offering supports for your teen. 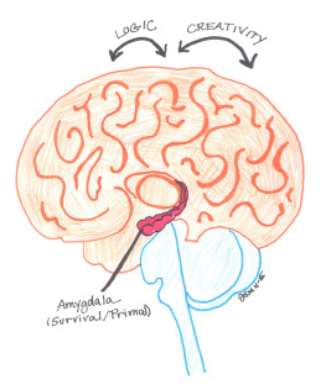 Anytime you are emotionally shaken from fear, anxiety, anger, or hurt, you are functioning from the part of your brain that developed first — the primal brain — or amygdala. During these intense feelings, there is a chemical that washes over the rest of your brain that cuts off access so that your only functioning abilities are in your survival center. This “hijacking” of your brain, as Daniel Goleman author of Emotional Intelligence refers to it, serves a critical role.5 In true survival circumstances, you are able to focus on fighting, fleeing, or freezing. If you are being hunted by a tiger, your mind focuses immediately on running away. Your body surges with adrenaline (a hormone) that gives you an extra boost of energy. Our high anxiety can quite literally paralyze thinking. Effective problem solving requires logic, language, and creativity though none can be well-utilized when greatly upset. But in family life, fighting with words or actions or fleeing out of the door is often not constructive, safe, or practical. Creating a plan (as you will be guided below) and practicing it can prepare children and adults to manage stress during a crisis, big or small. Fears typically relate to something in our lives or our future that is unknown. So, close that gap a bit by learning more about the issue at hand. Is your teen worried about getting sick? Do some research together on ways to prevent getting sick. This will help provide more facts and may alleviate some of their concerns. When you get more information and learn more about the issue, you, as a parent, can pinpoint exactly what’s causing the anxiety. Then when your teen learns more, that information can often lessen the worry or, at times, eliminate it altogether. Deep breathing is not just a nice thing to do. It actually decreases the chemical that has flowed over your brain – and allows you to regain access to your creativity, language, and logic versus staying stuck in your primal brain. Practicing deep breathing with your teen can offer them a powerful tool to use anytime, anywhere when they feel overcome with anxiety. Work on your family feelings vocabulary. Yes, at times, parents have to become a feelings detective. If our teen shuts down and refuses to tell us what’s going on, we have to dig for clues. Teens take longer to develop their feelings vocabulary. That’s because they hear feelings expressed in daily conversations much less frequently than thoughts or other expressions. In fact, it’s necessary to be able to identify our emotions to become more self-aware and successfully manage our emotions. Create a chill zone. During a time without pressures, design a “chill zone” or place where your teen decides they would like to go to when upset to feel better. Maybe their chill zone is a beanbag chair in their room or the couch in the family room. Then, think through together what items you might place there to help with the calm down. Teach your teen how to stop rumination. If you catch your teen uttering the same upsetting story more than once, then their mind has hopped onto the hamster wheel of rumination. In these times, it can be difficult to let go. Talk to your teen about the fact that reviewing the same concerns over and again will not help them resolve the issue, but talking about them might help, calming down might help, and learning more might help. Setting a positive goal for change will help. Practice what you can do when you feel you are thinking through the same upsetting thoughts. Say “Stop” out loud when you notice the same worries running through your mind. Then, try out one of your coping strategies to help you feel better and let go of those nagging thoughts. Encourage your teen to try it as well. Create a ritual for expressing gratitude so that it actually happens and becomes a family habit. You might say what you are grateful for before each family meal together. Or, you might leave a chalkboard up to write down grateful words and statements. Consider that ending the day reflecting on the goodness in your lives could just be the best way to send your teens off to sleep. Use “I’d love to see…” statements. When a teen learns a new ability, they are eager to show it off! Give them that chance. Say: “I’d love to see how you are able to bring your wise self right now.” This can be used when you observe their stress mounting. The best way to turnaround a misbehavior that may be taking place as a result of worries or fears is by recognizing when and how your teen makes good choices and acts positively in similar circumstances. Teens need to learn what to do as well as what not to do. At this point, you’ve taught your teen some new strategies for managing stress so that they understand how to take action. You’ve practiced together. Now, you can offer support when it’s needed by reteaching, monitoring, and coaching. Parents naturally offer support as they see their teen fumble with a situation in which they need help. This is no different. Learn about development. Each new age and stage will present differing challenges and along with them, stress. Becoming informed regularly about what developmental milestones your teen is working toward will offer you empathy and patience. Though it is easy to forget, your attention is your teen’s sweetest reward. It’s easy to get caught up in the busyness and business of getting tasks accomplished like getting to work and school on time in the morning. But if your teen is working hard to manage their big feelings, it will be worth your while to call it out. After all, your recognition can go a long way to promoting more of the same positive behaviors and expanding your teen’s sense of competence and responsibility. Add to their motivation to work hard with the following actions. Avoid gifts or other physical rewards for performance. These actually have a de-motivating effect on teens. When you remove the money, for example, have they internalized the skills and also the sense of responsibility for performing them? There’s less of a chance if you’ve offered a “bribe.” Focus on your attention as the best reward. This is an essential strategy in discipline for skill building. Engaging in these five steps is an investment that builds your skills as an effective parent to use on many other issues and builds important skills that will last a lifetime for your teen. Throughout this tool, there are opportunities for teens to become more self-aware, to deepen their social awareness, to exercise their self-management skills, to work on their relationship skills, and to demonstrate and practice responsible decision-making. American Psychological Association. (2014). Stress in America™: Are Teens Adopting Adults’ Stress Habits? Retrieved from http://www.apa.org/news/press/releases/2014/02/teen-stress.aspx on 9/22/18. Centers for Disease Control and Prevention. (2018). Teenagers (15-17 Years of Age). Retrieved from https://www.cdc.gov/ncbddd/childdevelopment/positiveparenting/adolescence2.html on Sept. 4, 2018. Parent Further. (2018). Ages 15-18: Developmental Overview. Search Institute. Retrieved from https://www.parentfurther.com/content/ages-15-18-developmental-overview on Sept. 4, 2018. Recommended Citation: Center for Health and Safety Culture. (2019). Stress. Ages 15-19. Retrieved from https://www.ParentingMontana.org.